Now you successfully created a library on your iPod and you can use it with all CopyTrans programs. If you don’t want to install iTunes on your computer and if you prefer to use CopyTrans Manager to organize your iPod, you can use iTunes on any computer you want (friends, family, colleagues…) to sync the iPod for the first time. CopyTrans programs work independent from iTunes libraries. 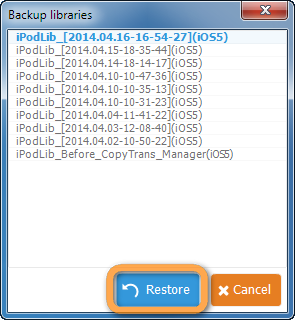 From time to time, CopyTrans Manager creates automatic backups of your iPod/iPad/iPhone library. Therefore, if you have already used your device with this program, you can recover one of your previous libraries. If it fails, please read this article. Important: If your iPod / iPhone / iPad has already been synchronized with iTunes and the above error message appears even when your iPod / iPhone / iPad library exists and is filled (at least with one song), please DO NOT synchronize with iTunes as it may cause a complete data loss.